A realistic, inexpensive, lightweight, adult CPR trainer that offers all the essential features. 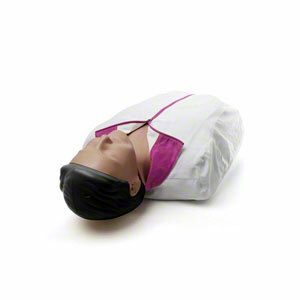 New Dark Skin Little Anne CPR Training Manikin with Soft Pack/Training Mat by Laerdal. A redesigned rib plate allows more vertical movement in the manikin's chest. This provides a more realistic feel when performing chest compressions. The updated chest construction facilitates using CPRmeter for real-time feedback on chest compressions. The new Little Anne also features a new head with molded hair and a new jacket. Includes: Soft Pack/Training Mat, 2 Resusci Manikin Faces, 2 Little Anne Airways, 6 Manikin Wipes, and Directions for Use. The Dark Skin Little Anne manikin is a realistic and lightweight adult CPR trainer with all the essential features for adult CPR learning. The Dark Skin Little Anne manikin has been developed to provide effective adult CPR training without compromising realism or quality. Its durable and convenient design makes hands-on practice affordable for every student. Durable construction allows unequalled long-term use. Internal compression testing has shown no product degradation after more than 1 million chest compressions at a depth of 2 inches. Please note: The Laerdal Little Anne® QCPR with Soft Pack/Training Mat is designed to meet the coming AHA 2019 Guidelines for CPR update which calls for CPR training manikins to have CPR feedback and/or monitoring features. The Little Anne QCPR is priced the same as this Little Anne w/Soft Pack. You may also upgrade your current Little Anne to the Little Anne QCPR with the Little Anne QCPR Upgrade Kit.